We have all faced instances when we have wondered if a person really means what he is saying. This is because they fail to back up their words by their actions. This thought made me delve more into the subject after which I did some research to realize that actions do in fact talk louder than the words in more sense than one. Communication consists of three major elements - the words we use, our tone of voice, and our body language. According to a research, the total impact of our communication consists of words (7%), Tone of voice (38%) and body language (55%). For an effective communication to take place, all three parts of the message must be congruent and consistent with each other. 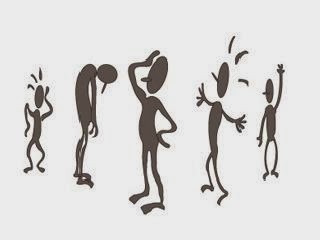 Body Language or “Kinesics” is the study of nonverbal communication. Body language is a combination of eye movement, body orientation, hand movement, head position, and leg activity. When messages from all these parts are combined there is a lot of ones body speaks. Although not an exact science, the serious student of body language can gain an extraordinary advantage in both social and professional situations. The idea that certain forms of nonverbal communication are universal to all humans dates all the way back to Darwin – documenting that interest in body language goes as far back as the early 1800’s. In more recent times, interest in body language first gained popularity in the early 1970s when Fast wrote the pivotal book, appropriately titled “Body Language”. Since then, it has gone on to become the topic of dozens of books and a specialty subject of psychologists around the globe. Well-chosen language said in the right way and with body language that is congruent, can touch the heart and soul, find a common ground, tear down walls of division, foster powerful new relationships and move people to take action. If there is a lack of congruency, the receiver will be confused and will have a tendency to accept the predominant form of communication rather than simply the literal meaning or words. For example, someone can say, “I love you very much.” However, the tone of voice can dramatically distort the meaning of these words. By placing an emphasis on different words or by “coloring” the statement with emotion rather than making it cold and distant, the meaning of these words can change significantly. Effective communication, hence, can be considered to be hinged on what many call as 7 C’s of communication. These have been elaborated below. Completeness - Message is complete when it contain all the facts the reader or the listener need for the reaction you desired. Achieving desired result without further expense on messages. In reply to an inquiry, answering all questions. Give something extra, when desirable. Conciseness - It means to the point - not brief but in fewest possible word or relevant according to the subject matter. Concreteness - It means to be very clear in thought and expression and must base on facts and figure during writing a message. Choose vivid, image –building words. Clarity - Using words that familiar to the message of the receiver. Choose precise, concrete and familiar words. Construct effective sentences and paragraphs. Courtesy - Being aware not only of the perspective of others but also their feeling. It stems from sincere you-attitude. Use an expression that shows respect. Correctness - It is a proper check on grammar, punctuation, and spelling. Furthermore, it is important to ensure that information in the message is factually correct. Use right level of language. Check accuracy of figures, facts & words. Consideration – This involves putting yourself in their place. Focus on “you” in place of “I” or “we”. Stress the positive in your message. Focus on you attitude instead of I. Show audience benefits or interest in the receiver. Emphasis positive and pleasant fact. I guess this all just forms theory and many of you are already wondering of what it means to you. I would agree with whoever says that I have not followed most basic concepts of presentations and reports by not providing how to actually put to use. I fully intend to continue working on this research and identify something which would apparently be more "valuable" for you as a reader !! More about various body language signs that you communicate unknowingly have been covered at Messages people send without putting them to words. Subscribe to the mail feed and connect with the blog socially to keep receiving more of such interesting articles.